This study is enrolling participants by invitation only. This study is a single site, prospective, observational trial utilizing a wrist-worn accelerometer to evaluate clinical outcomes of SCS and PNS in the treatment of chronic pain. A subject is considered to have met the primary objective if there is a statistically significant (p value < .05) increase in physical function. Up to 150 evaluable subjects will be recruited at this site on an ongoing basis. Evaluable subjects are defined as subjects that complete the End of Study visit. Each subject will be assigned an accelerometer and have data recorded for a seven-day period pre-implant trial to collect baseline data. The accelerometer will also be worn during the trial for a period of up to seven (7) days. If the trial is successful and the subject is implanted, the subject will wear the accelerometer for a seven-day period at least six (6) weeks post-permanent implant. 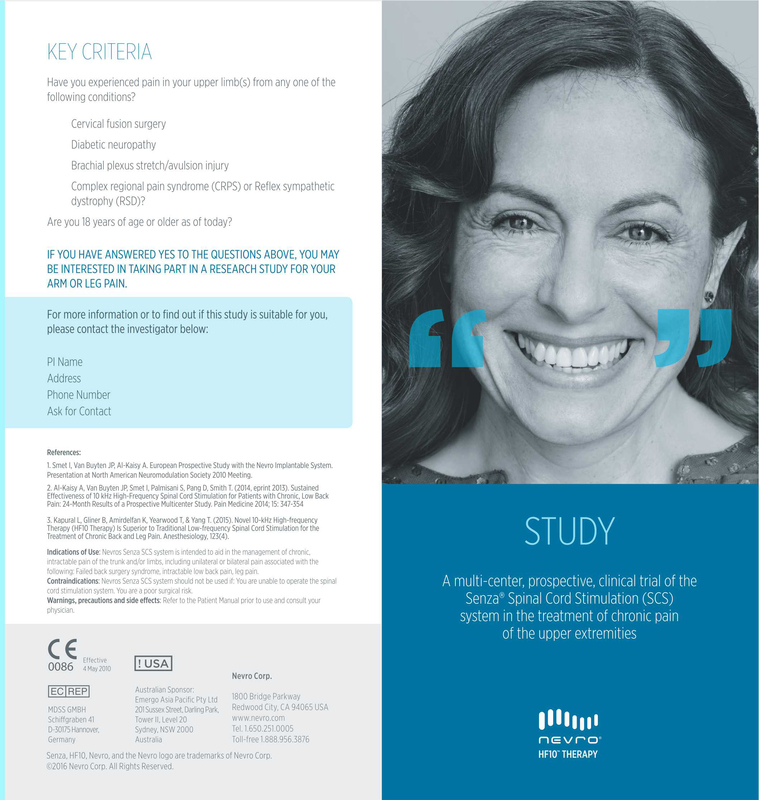 The following assessments will be administered to subjects at the baseline (pre-implant trial) visit, the end of implant trial visit and the end of study visit (8 weeks post-permanent implant): the Numerical Rating Scale (NRS) 11-point scale for pain; the SF-36 Health Survey; the Oswestry Disability Index (ODI). Subjects treated for neck pain will also complete the Neck Disability Index (NDI). Additionally, the subjects will be asked to complete a subject diary to record average daily NRS scores for days the accelerometer is worn. 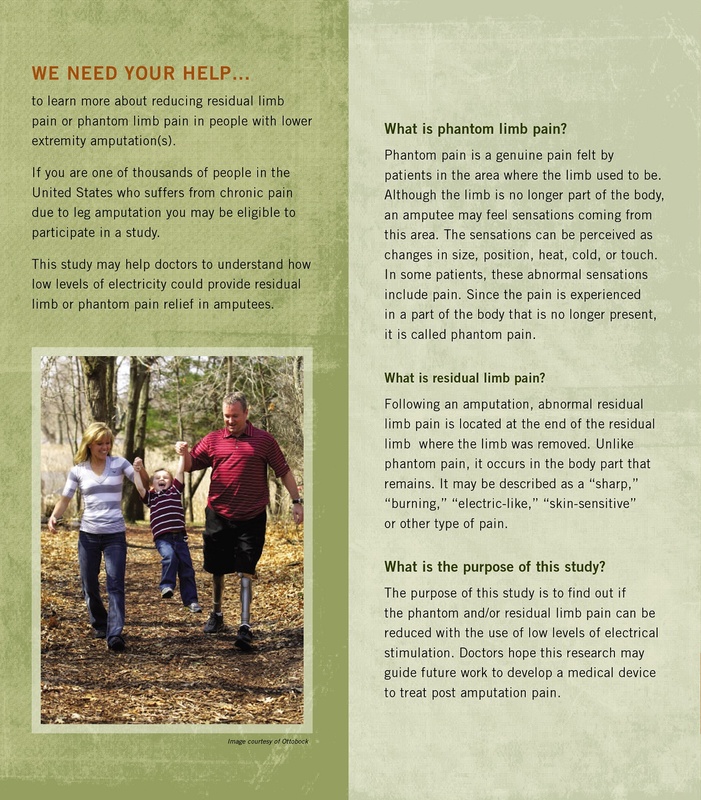 The subjects recruited for this study will be representative of the population of subjects with chronic pain and a candidate for SCS or PNS trial. Subjects recruited for this study must be 18 years of age or older. It is anticipated that approximately equal numbers of males and females will be recruited. No subjects will be excluded based upon his/her race or ethnicity. Melzack R, Wall PD. Pain mechanisms: a new theory. Science. 1965 Nov 19;150(3699):971-9. Review. Shealy CN, Mortimer JT, Reswick JB. Electrical inhibition of pain by stimulation of the dorsal columns: preliminary clinical report. Anesth Analg. 1967 Jul-Aug;46(4):489-91. Kumar K, Taylor RS, Jacques L, Eldabe S, Meglio M, Molet J, Thomson S, O’Callaghan J, Eisenberg E, Milbouw G, Buchser E, Fortini G, Richardson J, North RB. The effects of spinal cord stimulation in neuropathic pain are sustained: a 24-month follow-up of the prospective randomized controlled multicenter trial of the effectiveness of spinal cord stimulation. Neurosurgery. 2008 Oct;63(4):762-70; discussion 770. doi: 10.1227/01.NEU.0000325731.46702.D9. Breivik H, Borchgrevink PC, Allen SM, Rosseland LA, Romundstad L, Hals EK, Kvarstein G, Stubhaug A. Assessment of pain. Br J Anaesth. 2008 Jul;101(1):17-24. doi: 10.1093/bja/aen103. Review. Perruchoud C, Buchser E, Johanek LM, Aminian K, Paraschiv-Ionescu A, Taylor RS. Assessment of physical activity of patients with chronic pain. Neuromodulation. 2014 Jun;17 Suppl 1:42-7. doi: 10.1111/ner.12036. Review. Paraschiv-Ionescu A, Perruchoud C, Buchser E, Aminian K. Barcoding human physical activity to assess chronic pain conditions. PLoS One. 2012;7(2):e32239. doi: 10.1371/journal.pone.0032239. Huang KT, Martin J, Marky A, Chagoya G, Hatef J, Hazzard MA, Thomas SM, Lokhnygina Y, Lad SP. A national survey of spinal cord stimulation trial-to-permanent conversion rates. Neuromodulation. 2015 Feb;18(2):133-9; discussion 139-40. doi: 10.1111/ner.12199. Dworkin RH, Turk DC, Farrar JT, Haythornthwaite JA, Jensen MP, Katz NP, Kerns RD, Stucki G, Allen RR, Bellamy N, Carr DB, Chandler J, Cowan P, Dionne R, Galer BS, Hertz S, Jadad AR, Kramer LD, Manning DC, Martin S, McCormick CG, McDermott MP, McGrath P, Quessy S, Rappaport BA, Robbins W, Robinson JP, Rothman M, Royal MA, Simon L, Stauffer JW, Stein W, Tollett J, Wernicke J, Witter J; IMMPACT.. Core outcome measures for chronic pain clinical trials: IMMPACT recommendations. Pain. 2005 Jan;113(1-2):9-19. Review. Fairbank JC, Pynsent PB. The Oswestry Disability Index. Spine (Phila Pa 1976). 2000 Nov 15;25(22):2940-52; discussion 2952. Review. Vernon H, Mior S. The Neck Disability Index: a study of reliability and validity. J Manipulative Physiol Ther. 1991 Sep;14(7):409-15. Erratum in: J Manipulative Physiol Ther 1992 Jan;15(1):followi. 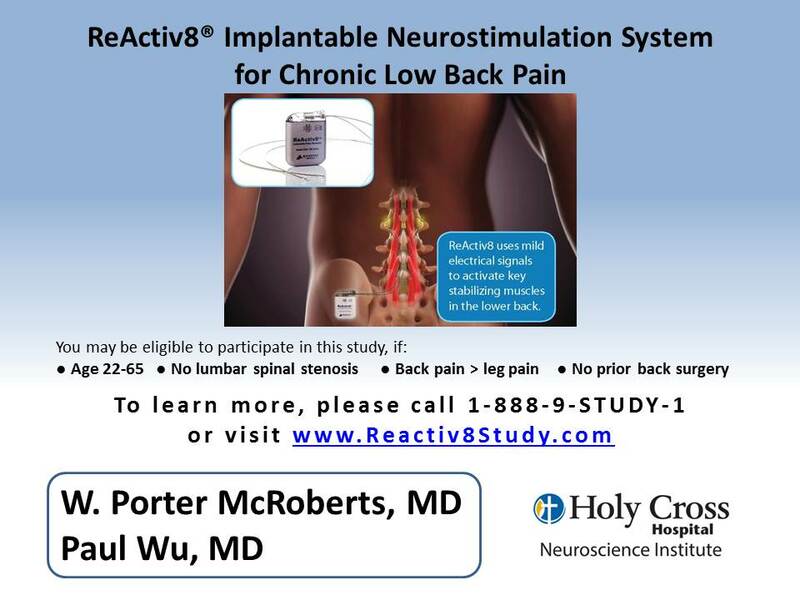 ReActiv8 is a surgically-implanted device that uses mild electrical stimulation to activate the key stabilizing muscles of the lower back. Similar to exercise programs used to restore muscle control, ReActiv8 stimulation is delivered twice a day for about 30 minutes. You control when to start and stop each stimulation session via a handheld wireless remote control. 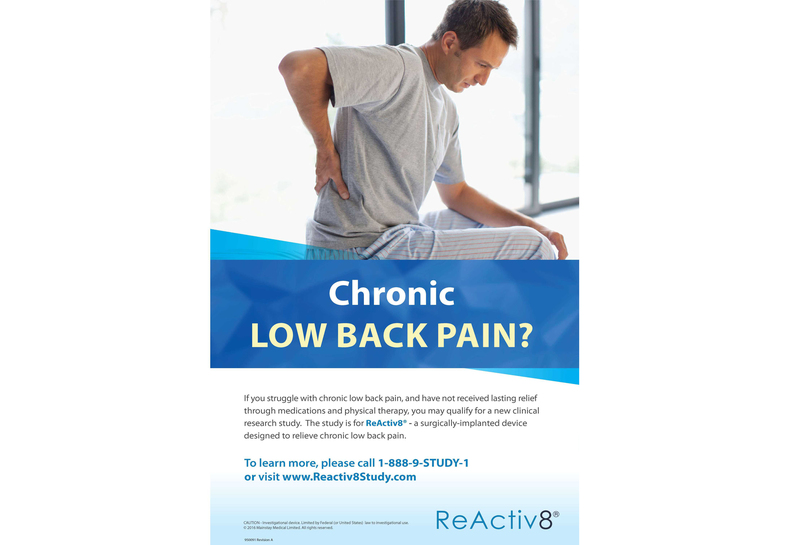 Over time, ReActiv8 is designed to help your body regain control over the muscles that provide lower back stability, which may help relieve chronic low back pain. ReActiv8 is placed through a minimally invasive, reversible surgical procedure. Your doctor will make a small incision to place thin wires, called leads, on either side of your spine. The leads connect to a small pulse generator (about the size of a matchbox). The pulse generator is implanted just below the skin, normally in the upper buttock. 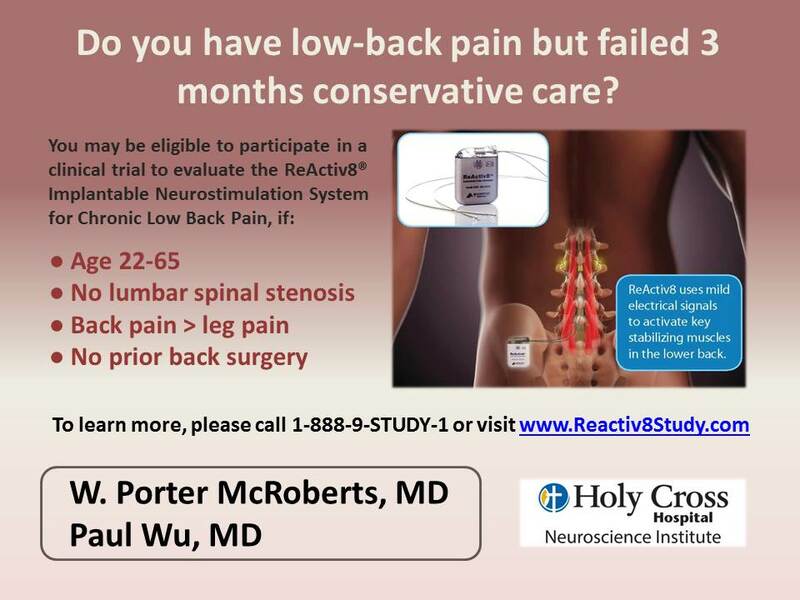 Right now, doctors at select centers throughout the U.S. are accepting participants for a new clinical study to evaluate ReActiv8 for the treatment of chronic low back pain. If you qualify and choose to participate in the study, you will receive the ReActiv8 system and all study-related care at no cost. Screening/Baseline To see if you might be eligible for the ReActiv8 Study, the first step is the Screening/Baseline evaluation. During this evaluation, your study doctor will perform a routine physical exam and will ask you about past medications and treatments for your back pain. You will also complete several questionnaires to measure the severity of your pain and its impact on your quality of life. If you pass the Screening/Baseline evaluation and wish to continue with the study, you will be scheduled to have the ReActiv8 system implanted. ReActiv8 Implant Procedure & Activation ReActiv8 is placed through a minimally-invasive, reversible surgical procedure (performed under local or general anesthesia). On average, the procedure takes about 1 – 2 hours, and you may remain in the hospital overnight and go home the day after. Approximately 7 to 14 days after the ReActiv8 system is implanted, you will return to your study doctor’s office to have the system turned on (activated). As part of the ReActiv8 study, you will be randomly assigned (like a coin flip) to either the Treatment Group or the Control Group. If you are assigned to the Treatment Group (50% chance), your ReActiv8 device will be set to deliver stimulation at an appropriate level for your circumstances. 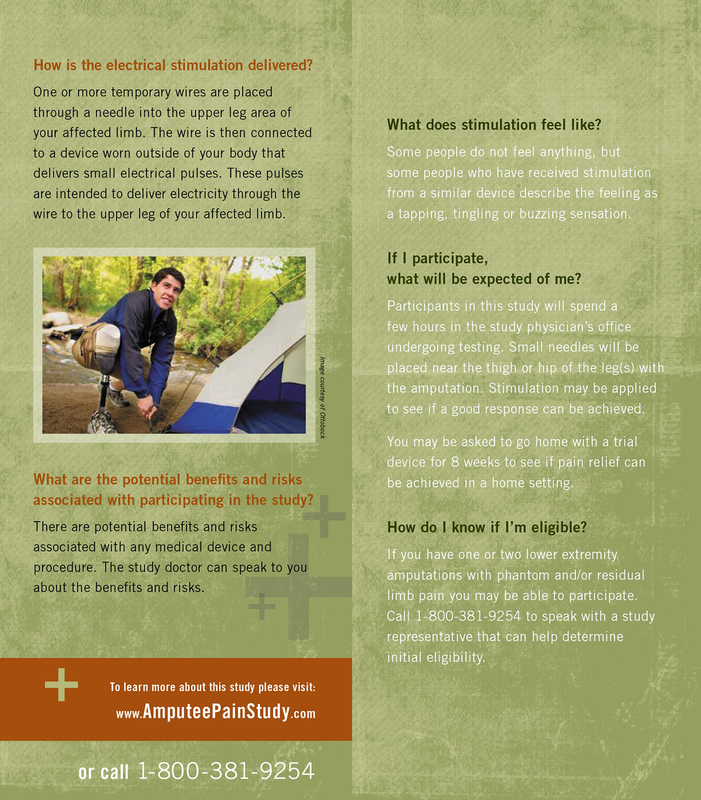 If you are assigned to the Control Group (50% chance), your device will be set to deliver only minimal stimulation. You will not be told to which group you were assigned until approximately 4 months after activation. However, if you were originally assigned to the Control Group, you will be given the option at this stage to “crossover” to the Treatment Group. Follow-Up Visits Following activation of your ReActiv8 device, you will be asked to return to your study doctor’s office about 8 times over a 1-year period, and then once a year thereafter (up to a maximum of 6 years). These visits are an important part of the study, as they allow your study doctor to closely monitor your individual results and experiences. During these visits, the settings of your ReActiv8 device will be reviewed, and may be adjusted as needed. 2. How is ReActiv8® designed to work? 3. How do I conduct my ReActiv8 stimulation sessions? You will be asked to apply stimulation to your back two times a day, each time for about 30 minutes. You will be asked to do this while you lie down on your side or your stomach. It is recommended you conduct your sessions about same time every day, with one time in the morning and one time in the evening. 4. Are there any costs involved in the ReActiv8® Study? If you choose to join the ReActiv8 Study, you will receive all study-related care at no cost. This includes the ReActiv8 system and procedure, as well as any study visits to your study doctor’s office. You may also be compensated for travel expenses to attend study visits. 5. Why is there a Control Group? To test a new treatment it’s important for researchers to be as certain as possible that any changes are because of the new treatment. The best way to do this is to have two groups that have the same characteristics and undergo the same care, except for the new treatment being studied. 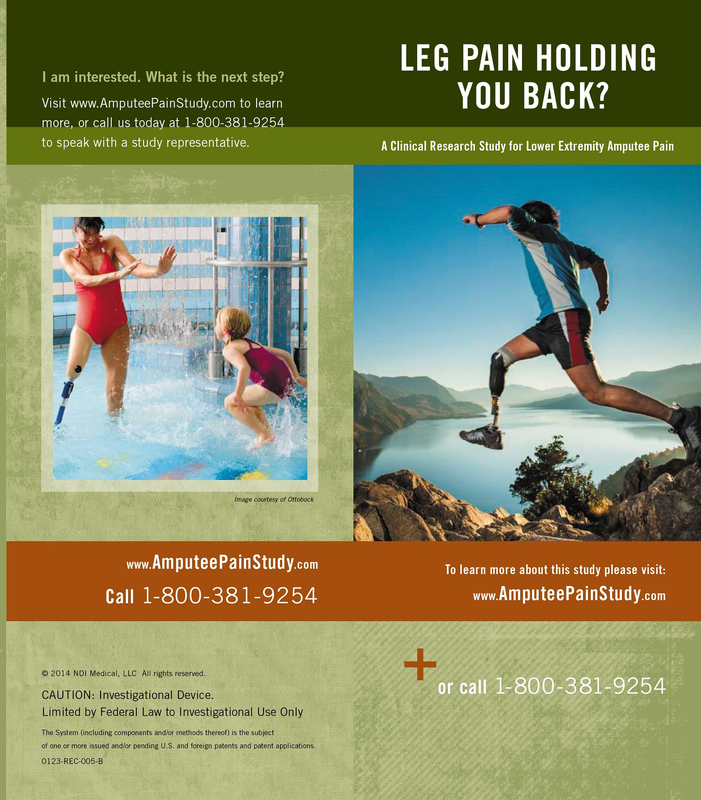 The study is being sponsored by MML US, Inc. (www.mainstay-medical.com), a global medical device company with offices in the US, Australia, and Ireland. 7. How do I know if I am eligible for the ReActiv8 Clinical Study? 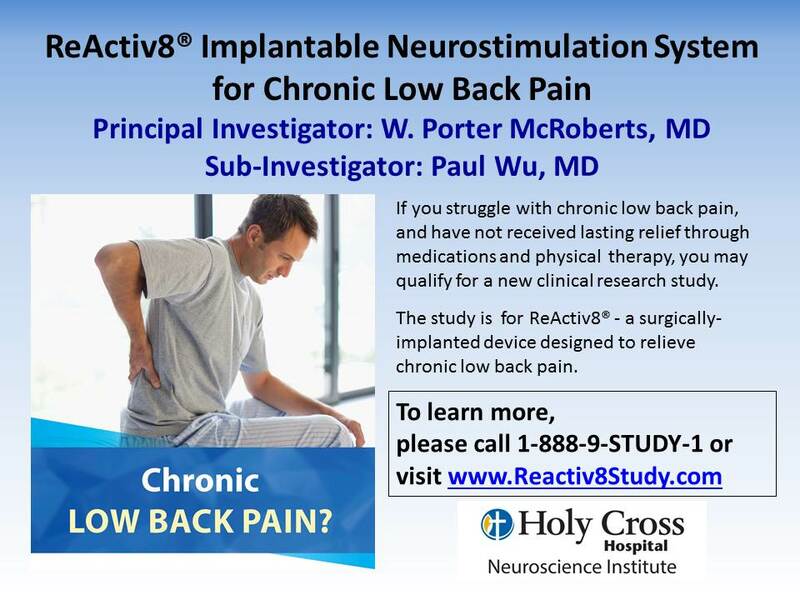 If you struggle with chronic low back pain and have not received lasting relief through medications and physical therapy, you may qualify the ReActiv8 Clinical Study. If you are interested in possibly participating in the study, your study doctor and team will help see if you meet the study criteria. Thank you for your interest in the ReActiv8 Clinical Study. Please contact us if you have any questions. What is the mechanism of DRG stimulation? What is a DRG stimulation system made up of? How is a DRG stimulator inserted? Injury or irritation of the dorsal root ganglion can lead to intractable symptoms of neuropathic pain that may or may not respond to typical treatments. This can lead to additional complications in the form of impairment in functioning for the individual spinal cord stimulation. Applying stimulation to the DRG allows treating specific areas of the body with pain hence targeting specific focal area. Easy accessibility of DRG makes it a perfect target for treating chronic neuropathic pain that is not treated with traditional spinal cord stimulation, such as the hand, chest, abdomen, foot, knee or groin pains. Dorsal root ganglion stimulation works by blocking the transmission of pain. As every sensation passes through dorsal root ganglion, the signal of pain to the spinal cord and brain is interrupted. Stimulating the nerve bundles with low-intensity electrical impulses is also believed to reduce pain by replacing the sensation with a pleasant tingling sensation, known as paresthesia. Electrodes: These are a straight insulated wire with a curve on the tip to fit around the DRG. There are four electrical contacts near the tip to deliver the electrical pulses. The wire is passed into the spine through a large hollow needle. Up to four wires can be connected to one IPG so up to four DRGs can be stimulated, each with its own wire. An implantable pulse generator (IPG): It is a small box that contains a battery and circuitry to produce the stimulus current:. If the electrode is being put in the lower back (e.g. for leg pain) the IPG is usually implanted under the skin of the abdomen (tummy). If the electrode is being put in the spine in the neck (e.g. for arm pain) the IPG may be implanted under the skin below the collar bone. Programmer: It is a handheld device that is given to the patient to adjust the stimulator to control pain. As with every surgical procedure, there are risks involved with dorsal root ganglion neuromodulation. Though very little is known about the consequences of injecting pain relieving medication within the dorsal root ganglion or the spinal cord, neuromodulation of the neural tissue within this area is believed to be safe and completely reversible. The procedure itself for implanting the device is regarded as safe and conducted in such a way as to avoid inflammation or additional pain to the individual. In fact, many may return to normal activities of daily function within several days. 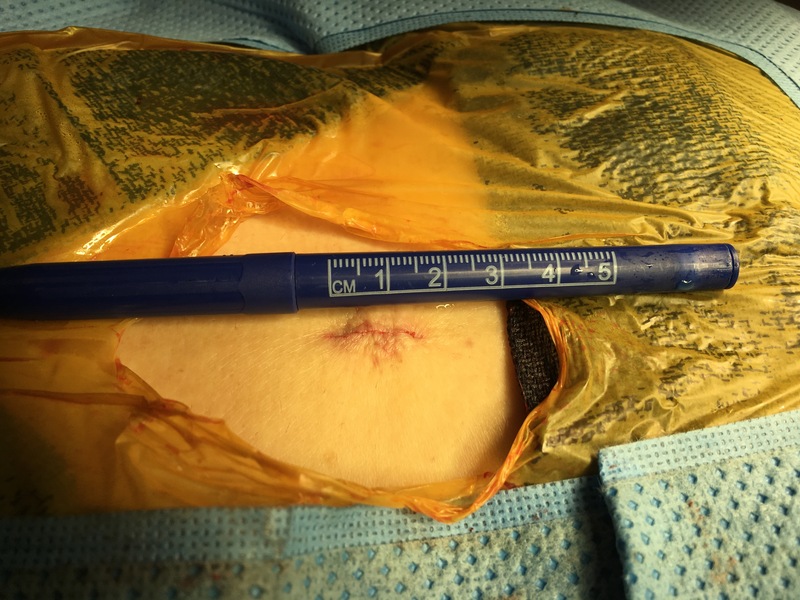 Risks associated with the condition are considered to be mild in nature and generally include minor bleeding at the site of the injections, infection, neural injury, and local anesthetic systemic toxicity. Individuals may also have a reaction to the medication used during the procedure. The procedure is carried under local anesthesia. When the skin has been numbed, a needle is passed into the space near the DRG and the electrical lead is fed through it and guided into place using Xrays. Since the patient is awake, the effect of stimulation can be tested via the lead straight away. If the patient feels the tingling sensation, the procedure is completed by making a small incision around 3 cm nearby to allow placement of an implantable pulse generator under the skin and connecting the lead to it. If the test stimulation doesn’t give a definitive effect on the patient’s pain, a temporary extension wire is attached to the lead which is then brought out through the skin so that it can be tested for a few days using an external stimulator, before deciding whether the system is working well enough to complete. DRG Stimulation is a more advanced and refined version of traditional spinal cord stimulation. Instead of positioning the leads over the posterior aspect of the spinal cord, smaller and more precise leads are placed over the dorsal root ganglion itself. Specifically, it is placed on the ganglia residing in the lumbar and sacral regions of the spine. This allows for greater and more targeted control of pain in the lower limbs. Dorsal root ganglion is now being preferred over spinal cord stimulation. Patients trialed with DRG stimulation have a greatly improved chance of success with much better pain relief. Dorsal root ganglion stimulation is a procedure for providing relief from symptoms of chronic pain resulting from a neural injury. 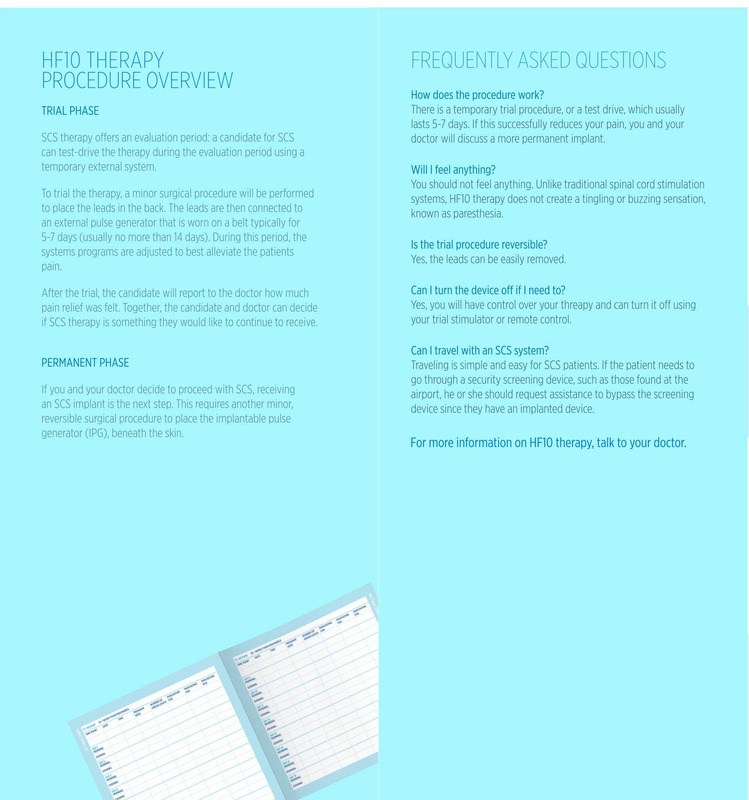 This interventional approach is regarded as a relatively safe and effective procedure, with a low risk for side effects. The dorsal root ganglion is considered an ideal target for delivering pain relief because of a more targeted approach. Also dorsal root ganglion requires less neuronal stimulation to alter pain hence the devices for this treatment can work for a long time. Another benefit of dorsal root ganglion stimulation is that the dorsal root ganglion lacks the protective capsular membrane that is found on other peripheral nerve fascicles. It has a permeable connective tissue, making it an ideal target for the application of neuromodulation. The Food & Drug Administration (FDA) just granted approval to DRG Stimulation for use within the U.S. as of February 2016 for the treatment of CRPS. Currently, the only device capable of DRG Stimulation is called the Axium which is available. 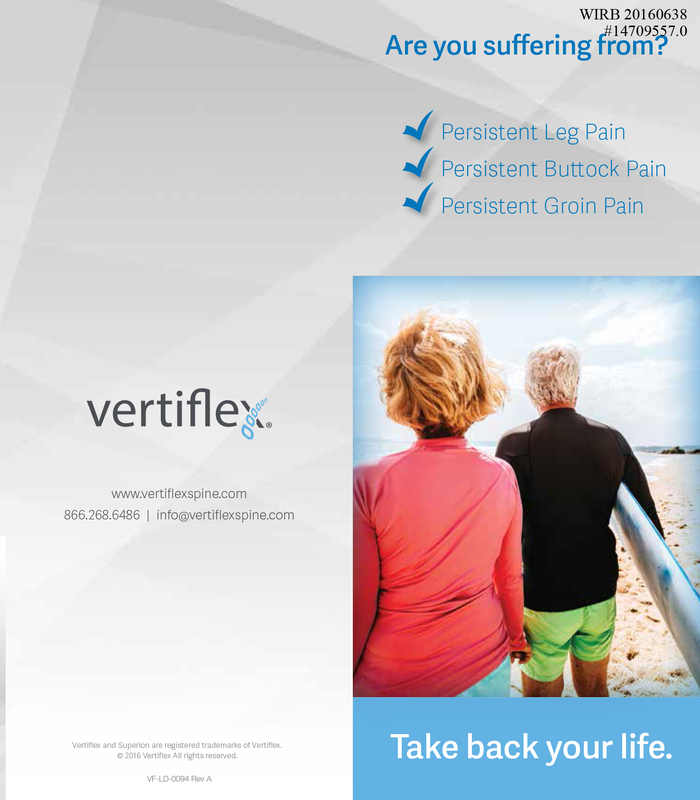 Our site in Fort Lauderdale is the first site in Florida to implant the DRG stimulator. 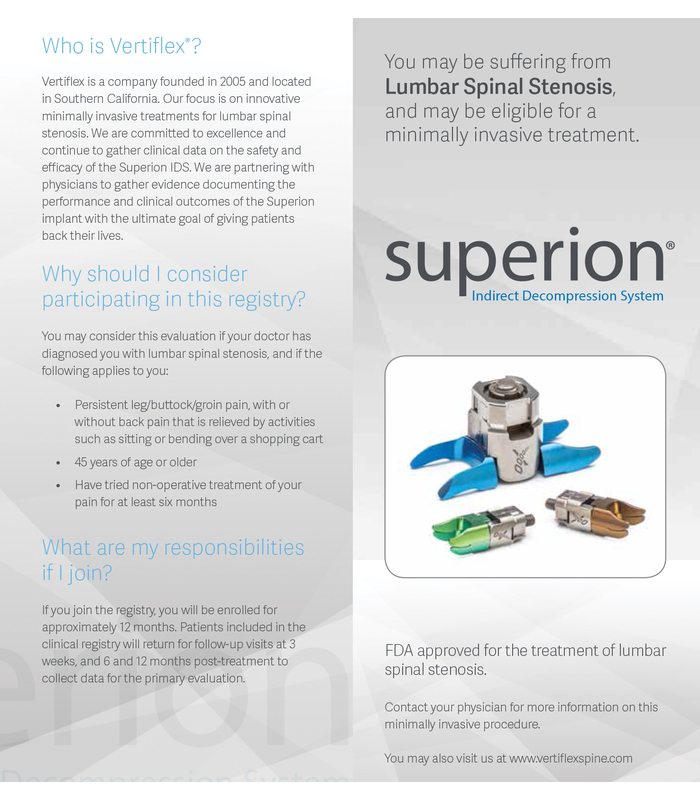 What is Superion® Interspinous Spacer (ISS)? The Superion® InterSpinous Spacer (Superion Spacer) is a small H-shaped spinal implant system for the treatment of moderate lumbar spinal stenosis implant. The device fits between two adjacent bones (spinous processes) in the lower back. This limits movement (extension) at the level where the device is placed. The Superion Spacer is made of titanium alloy. If standing or walking causes pain,weakness or fatigue in the legs, you’re probably suffering from lumber spinal stenosis or LSS. As you stand or walk, the lumbar curvature becomes more pronounced, the spinal nerve more crowded, and the back and legs more painful. The aim of the Superion spacer is simply to hold the spine in the same open and neutral position as when sitting. 1) you suffer from neurogenic claudication from spinal stenosis: increased pain and tiredness in the buttocks or legs with walking that is relieved with sitting. The Superion® ISS system is designed to deliver the implant through a single small incision in the patient’s back. The procedure can be performed under local anesthesia on an outpatient basis and closed with a single suture. Spinal stenosis is a narrowing of the passageways in the spine. When the spinal cord and nerve roots get pinched or compressed during extension of the spine due to the narrowed passageways, this can cause pain, numbness, tingling ,weakness in the leg(s) or legs and back. The device is designed to limit extension of the spinal level to relieve these symptoms. The Superion Spacer treats patients who suffer from pain, numbness, cramping in their buttock, groin, or legs with or without back pain. The Superion Spacer is used in patients who have difficulty with daily physical activities and who experience relief in flexion from their symptoms. Feeling relieved by rest (sitting or lying down). Tingling, weakness or numbness that radiates from the lower back into the buttocks and legs. In the neck (cervical spine).Cervical stenosis can cause numbness, weakness or tingling in a leg, foot, arm or hand. Tingling in the hand is the most common symptom. Nerves to the bladder or bowel may be affected, leading to incontinence. In the lower back (lumbar spine).Compressed nerves in your lumbar spine can cause pain or cramping in your legs when you stand for long periods of time or when you walk. The discomfort usually eases when you bend forward or sit down. The device should help relieve the symptoms of moderate lumbar spinal stenosis by blocking extension of the affected spinal level. Allergy to metals such as titanium or titanium alloy. Spinal anatomy or pre-existing diseases that would prevent implanting the device or cause the device to be unstable once implanted, such as isthmic spondylolisthesis or greater than grade 1 degenerative spondylolisthesis, ankylosis, fracture of the spinous process or other bones in the spine such as the pars interarticularis, or laminaeon either side or both sides of the back, scoliosis, nerve root compression which causes bladder, bowel, or sexual dysfunction. Morbid obesity, defined as a body mass index(BMI) greater than 40. This surgery helps relieve pressure on your spinal nerves. 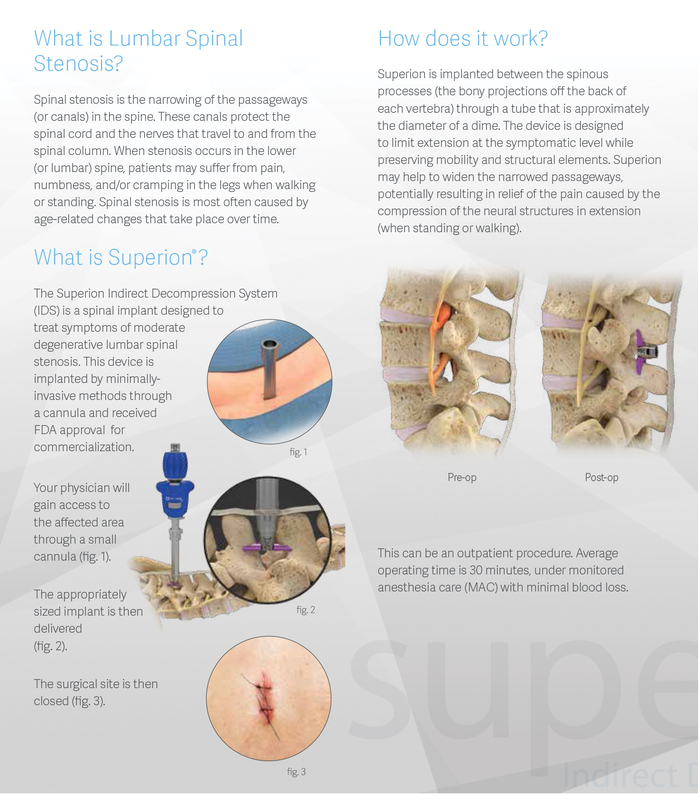 The Superion implant is designed to keep your spine still so when you stand upright the nerves in your back will not be pinched or cause pain. The Superion implant is intended to allow you to continue to move your back more than with a fusion surgery. With the Superion implant in place, you should not need to bend forward to relieve your pain. Dr.McRoberts takes the privilege of introducing the scientist who worked tirelessly for 10 years to create the High Frequency SCS. He gave happiness to his patients by giving them a ray of hope during their pain and agony. The success rate of this device is insurmountable. Dr.W.Porter McRoberts is the first Interventional Physiatrist to use Nevro in South Florida. 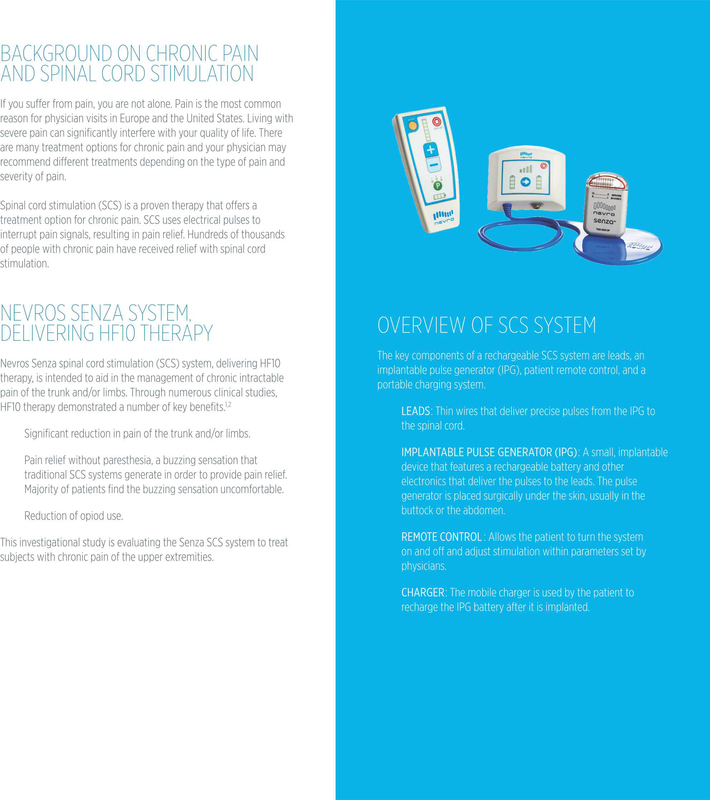 Nevro SCS is innovative evidence-based neuromodulation platform for the treatment of chronic pain. At Nevro, we believe true innovation transforms more lives. Nevro explored beyond traditional SCS frequencies in search of better therapeutic outcomes. Combining high frequency at 10 kHz with a unique waveform and a specific treatment algorithm resulted in HF10 therapy: A paresthesia free treatment proven to provide superior pain relief to more patients. Randomized, controlled trial compared HF10 therapy with traditional SCS: 10 U.S. centers, 241 enrolled, 198 randomized, 171 implanted. Leonardo Kapural, M.D., Ph.D.; Cong Yu, M.D. ; Matthew W. Doust, M.D. ;Bradford E. Gliner, M.S. ; Ricardo Vallejo, M.D., Ph.D.; B. Todd Sitzman, M.D., M.P.H. ; Kasra Amirdelfan, M.D. ; Donna M. Morgan, M.D. ; Lora L. Brown, M.D. ;Thomas L. Yearwood, M.D., Ph.D.; Richard Bundschu, M.D. ; Allen W. Burton, M.D. ; Thomas Yang, M.D. ; Ramsin Benyamin, M.D. ; Abram H. Burgher, M.D. 5 centers, 24 patients trialed with both traditional SCS and HF10 therapy. Novel spinal cord stimulation parameters in patients with predominant back pain. Tiede J1, Brown L, Gekht G, Vallejo R, Yearwood T, Morgan D.
HF10 Therapy proven to provide patients superior relief without paresthesia. 8 out of 10 people who try Hf10 therapy have significant relief of back pain and leg pain. This is the incision size for the Superion spacer. michael kors handbags on What’s an epidural?